Abdel-Moneim Abu al-Fotouh was among those detained in an escalating series of arrests in Egypt ahead of the upcoming presidential elections on March 26. The 66-year-old Islamist leaning figure was arrested hours after returning from London, where he criticized President Abdel Fattah al-Sisi and the absence of competition in the elections, in interviews with BBC Arabic, Al Jazeera and Al Araby TV – the last two are banned in Egypt. Along with others arrested in his party, including the deputy chairman, Abu al-Fotouh was charged with “spreading false news” and other allegations. Abu al-Fotouh was a presidential candidate in 2012 and the head of the Strong Egypt Party. He had faced harsh conditions, having to be transferred to a hospital at least once during interrogations. His home was raided without search or arrest warrants, according to his lawyers, and has been held in Cairo’s Tora prison complex. Joining them was Khairy Ramadan, a pro-government anchor arrested early in March for suggesting that Egypt’s police officers earn low salaries, which allegedly amounted to “insulting the police.” These are among the many other arrests for criticizing the Egyptian regime. “These arrests show that Egyptian authorities will stop at nothing to silence free speech, not only dissent, using national security and combatting terrorism as pretexts for doing so,” Hussein Baoumi, Amnesty International Campaigner, told The Globe Post. “The president even went as far as saying that criticizing the military and police is treason,” he added. Renowned for its rich history and ancient civilization, Egypt has come under the spotlight in recent years for other reasons. Its most capturing story is its journey through revolution and its struggles after a counter-revolution two years later. Like the rest of the Arab world, Egypt was hit by the Arab Spring uprisings in 2011 –- one of modern history’s most significant events. Activists across the Middle East and North Africa pushed for political reform, aiming to topple their ruling governments. Unlike Yemen, Syria, and Libya, however, Egypt did not fall into civil war following its uprisings. While the 30-year-long President Hosni Mubarak was forced to abdicate, with protesters opposing his authoritarian rule and lack of social and economic reforms, followed by a counter-revolution two years later, the country still stands relatively strong. Going from a military-backed autocracy into a regime that is absolutely dominated by the military on many levels, activists of all creeds –- from Islamist to secular and liberal feel that the revolution is incomplete. Activists, analysts and even casual observers feel attempts to establish democracy have failed. Many feel Egypt’s democratization has been held back by its military. Even in 2011, many protested military dominance following Mubarak’s downfall. After the 2013 military-led coup, Egypt’s military is more powerful than ever, dominating nearly every aspect of the country’s political system. Now under these extraordinary circumstances, Egypt is poised to re-elect its leader in presidential elections that would be held between March 26 and 28. The results will be announced on April 2. A runoff will be held if no single candidate gains more than 50 percent of the vote. Yet all the original serious candidates have dropped out of the race or have been arrested. “I can’t imagine that President Sisi isn’t going to win this election,” Mirette Mabrouk, Senior Fellow and Director of the Egypt Program at the Rafik Hariri Center for the Middle East, Atlantic Council, told The Globe Post. “There was only ever one challenger who would have stood any chance of attracting enough voters to pose a risk to the president in the polls and that was Ahmed Shafik,” said Mabrouk. “Those that did drop out cited what they feel as a level playing field,” she added. The leader of the centrist El-Ghad party and now the only candidate left facing Sisi. Moustafa registered just hours before the deadline for nominations. He pledged a strong program to reduce unemployment, and to develop living standards, healthcare, education, transportation while preserving national security. Shafiq was a high-ranking air force general and former Prime Minister under the Mubarak regime. He lived in exile in the United Arab Emirates (UAE) after losing to ousted President Mohammed Morsi in the 2012 presidential elections. The UAE authorities deported him to Cairo in December after announcing his bid to run in the Egyptian elections. After his return, government officials allegedly pressured him not to run. Pro-government media also attacked him. He issued a statement in January that he would abandon his candidacy, as his time in exile had left him out of touch with Egyptian life. A former military general and the last major challenger to Sisi after the other candidates resigned. Annan argued that the military should remain neutral in the election. He has faced a lot of charges for defaming the military. He was then detained for questioning. Nephew of former Egyptian President Anwar Sadat. He pulled out because he claimed there was a climate of fear, and he feared for the safety of his supporters if he challenged Sisi. Another former military general. Konswa was accused of violating military rules and sentenced to six years in prison. His lawyer Asad Haykal said the charges against him were breaching the military code and espousing political views in a video. The military has played a substantial part in Egyptian politics for decades. While Egypt became a modern state in 1922, historians often see 1952 as the year it became genuinely independent from external rule. In this year, the military launched a coup that toppled the British-backed monarchy, replacing it with a republic headed by Gamal Abdul Nasser, who was previously served as a military advisor. The powerful military dates to the rule of Muhammad Ali in Egypt (1769-1849), who was previously a commander in the Ottoman army, but it assumed a significant role in politics after the 1952 coup. Since then, Egypt has been ruled by a military general, excluding the Muslim Brotherhood rule in 2012-2013. Since Nasser first stamped out demands for democratic rule in Egypt, there had been little opportunity for the Egyptian people to steer their government’s path. When Anwar Sadat, the late Egyptian president, struck a deal in Camp David in 1978 that established peace with Israel in exchange for Sinai (then occupied by Israel), not many in this most populous Arab nation endorsed it. Sadat was soon assassinated during a military parade by troops allegedly sympathetic to the Muslim Brotherhood. Mubarak, then-vice president, was wounded in the attack. Since that incident, the Muslim Brotherhood has been branded by the military as the most existential threat to the nation. Ahead of parliamentary elections in 2010, the Muslim Brotherhood has seen one of the most sweeping security clampdowns by the regime of Mubarak. Thousands of Muslim Brotherhood activists were jailed or stifled. As soon as Egypt concluded its parliamentary elections in December 2010, a sudden uprising in Tunisia brought down the country’s longtime dictator Zine El Abidine Ben Ali, inspiring Egyptians to follow the suit. In 18-day protests that captured the world’s attention, Egyptians battled security forces on streets and forced Mubarak to step down in February 2011. He handed power over to the Supreme Council of the Armed Forces (SCAF), effectively ceding power to the military that would rule the country with an iron fist for one more year. Three days after the nationwide protests had started, Morsi and other key Muslim Brotherhood leaders were imprisoned. Exploiting the chaos during the upheaval, thousands of people, including Morsi and his colleagues, broke out of the prison outside Cairo. An Egyptian court would sentence him to death in 2015 for that particular incident (later overturned), along with a number of other politically motivated charges. Many view Morsi’s prison break as a prelude to the political and economic turmoil that followed his election a year later. Following decades of repression and underground activism, the Muslim Brotherhood and its similar affiliates in the region had the biggest shot at governance during the Arab Spring uprisings. The mass upheavals that shook the region were vindictive of their long demands that these countries had been ruled by pro-Western and anti-democratic despots and that the Muslim Brotherhood would only represent the people. The Muslim Brotherhood was founded in 1928 by cleric Hassan Al Banna, who initially attempted to restore social and religious values that had been stripped away by British colonialism. It soon became militarized, however, fighting against the monarchy and aiming to establish an Islamic state in Egypt. After Gamal Nasser came to power, he clamped down hard on the Brotherhood, dashing their hopes that the anti-imperialist Nasser would give them more power. Subsequent leaders, Hosni Mubarak and Anwar Sadat, were equally firm, driving the group underground and keeping it illegal until it became unlocked after 2011 revolution. The Egyptian branch of the Brotherhood had reformed itself by 2011 and instead focussed on seizing power via the ballot box. Many prisoners released during the 2011 protests, numbering in the tens of thousands, joined the Brotherhood and other revolutionary factions. The Brotherhood finally had some success in elections later that year. Its political party, known as the Freedom & Justice Party (FJP), led a coalition of parties called the Democratic Alliance, winning 37.5 percent of the votes, and 44.9 percent of parliamentary seats, closely followed by the Salafist Al-Nour Party, who won 27.8 percent and 25 percent respectively. In the May-June 2012 presidential elections, the Brotherhood secured its success, with FJP leader Mohammad Morsi winning 51.7 percent of the vote, against independent Ahmed Shafiq, a former prime minister under the Mubarak regime. However, their success was short-lived. While many Egyptians were looking for something radically different, political Islam soon lost its appeal. Not only were Muslim Brotherhood figures inexperienced in holding political power, they struck a deal with the military to change the constitution and the political turbulence led to a devastating financial meltdown. Fears that the Brotherhood government was to propose more radical policies, such as lowering the age of marriage for females to 12, as well as brewing sectarian conflict, led millions of Egyptians to protest the government of Morsi. By June 30, 2013, millions of Egyptians poured into the streets in Cairo and across Egypt, calling for Morsi to stand down. The military issued a 48-hour deadline for Morsi to take steps to resolve political discord. Striking a defiant tone, even after he was taken into custody by the military, Morsi rejected to abdicate the presidency, citing popular electoral victory. On July 3, the military forcibly ejected Morsi from power, starting Sisi’s hardline rule in the conflict-ridden country. Mohammad Affan, a political analyst and former Egyptian activist, told The Globe Post that secular, liberal political forces and their supporters backed the military coup as they opposed the Muslim Brotherhood despite its authoritarian nature. “The Muslim Brotherhood first aimed to gain power by parliamentary election, and then tried to seize control of all institutions in Egypt,” Affan said, referring to constitutional changes and troubling legislations in Morsi’s brief rule. In November 2012, Morsi sparked protests after issuing a declaration granting himself unchecked powers. “The secular forces and their supporters felt very threatened by the Muslim Brotherhood. Even military rule was preferable to a democratically-elected Islamist party. Many hoped they could establish a more democratic regime after getting rid of the Islamists,” he added. After the military coup, the military formed an interim government. 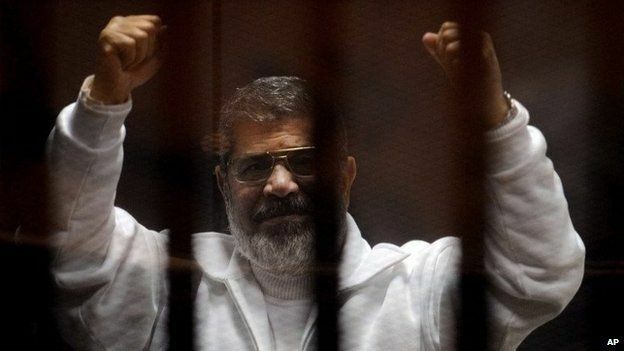 Morsi and many other Muslim Brotherhood figures were sentenced to death or life in prison; others were exiled to Turkey, Qatar, the United Kingdom and elsewhere. The interim government held power after the coup, until new presidential elections in May 2014. Abdel Fattah al-Sisi, chief of the armed forces and Mubarak’s former head of intelligence, defeated Hamdeen Sahabi of the secular Nasserist Popular Current party with 96.91 percent of the popular vote. Before 2012, Sisi was not known by many Egyptians until Morsi appointed him as the commander-in-chief of the armed forces and minister of defense. Shortly after his appointment, Sisi established a council that would decide the fate of the Muslim Brotherhood government amid a political chaos, which included clerics and opposition politician Mohammed el Baradei. Since then, the military has used its power to stamp down the Muslim Brotherhood yet has extended this ability to target non-Islamist critics of the regime as well. “First, the authorities came for the Muslim Brotherhood. The approach was extremely violent, from killing almost 1,000 people on a single day to enforced disappearances. This led the civil society and activists to object, which Egyptian authorities identified as ‘sympathy with the MB’,” said Hussein Baoumi. The situation in Egypt has reversed so dramatically that January 25 revolution that promised more freedom and civil liberties for an impoverished population turned out to be a gateway to more chaos and disorder. While many of his supporters view Sisi as a response to the economic downturn following the revolution, his hardline social and economic policies, coupled with anti-democratic practices, have made his regime one of the most repressive rules in the world. Since the coup, human rights groups and analysts have reported increased cases of state repression and violations against people, as well as flawed elections. “On all scales, such as free elections, human rights, party politics and the devolution of powers, all these factors show that the democratic transition in Egypt has clearly failed,” Affan said. Much of this can be traced back to the dominance of Egypt’s military, according to him, which acts as a ‘mafia’-like force in the government. The army had used torture and killings before the 2013 coup. Over 1,000 people went missing during the 18 days of demonstrations in 2011. Even before the coup of 2013, there were reports of the military carrying out torture or other means of repression. During the height of the protests, and as political winds were blowing against the region’s decrepit leaders, Western nations, including the United States, have called on Mubarak to step down, an extraordinary step against an allied country. Feeling the pressure, the military organized the orderly transition of power and forced Mubarak to quit. Some have suggested that the military allowed Mubarak to fall to avoid the entire downfall of the system, planning to refashion itself as a guardian of the military regime no matter what type of political party wins the elections. Egypt’s military now dominates everything in Egypt, from factories for home appliances, pasta and cars, to constructing football stadiums, social housing, to running gas stations, shipping firms and cleaning companies. It has control of public transportation, water and sewage systems, Internet lines, house allocation and many more key sectors. “The military is a huge economic force in Egypt. The military’s economy is estimated at 40 percent of the nation’s economy. Even during the transitional period, the military was obsessed with not allowing anybody to audit the military’s economic share. They would not let anyone have the right to monitor their economic activities,” said Affan said. While Egyptian authorities operate under the guise of “targeting extremists and protecting national security,” such as executing as many as 15 Islamists convicted of terrorist attacks in the Sinai in December 2017, often non-extremist critics of the regime have also been targeted. Human rights NGOs have tracked increased abuses against political figures, activists, journalists since the 2013 coup. “This is the worst time to be a journalist in Egypt in recent memory. Egypt was the third worst jailer of journalists last year and among worst jailers of journalists worldwide since 2013,” Sherif Mansour, Egyptian human rights activist and MENA Director for Committee to Protect Journalists (CPJ), told The Globe Post. Mr. Mansour said that out of the 20 journalists in Egyptian jails, 12 have not been convicted or sentenced for any crime. More than half of them are put in abusive conditions and suffer from poor health. “Among them is photographer Mahmoud Abou Zeid, known as Shawkan, who was arrested covering a violent dispersal of protesters by Egyptian security forces and has been in pretrial detention for more than four years. He and his 738 co-accused are charged with possessing weapons, illegal assembly, attempted murder, and murder. Shawkan is anemic and needs blood transfusions, but has been denied healthcare, according to his family,” he said. 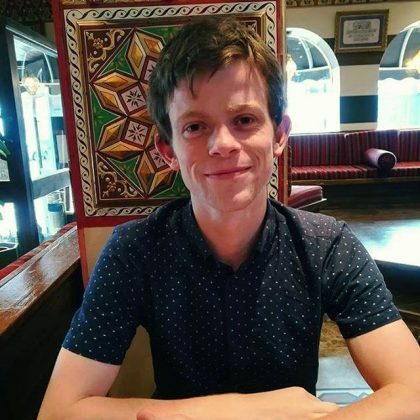 Just a few days before the elections, British journalist Bel Trew, a reporter for Times, was deported from Egypt on bogus accusations that she broke Egyptian laws. Egyptian authorities have blocked at least 496 news outlets, blogs, websites of human rights organizations since May 2017, as well as tools used to bypass the blocks, according to the AFTE and the Open Observatory of Network Interference. Amnesty International has also reported cases of torture and enforced disappearances of dissidents. Mohamed al-Kassas, the deputy head of Egyptian opposition party Misr al-Qawi, was also reportedly been targeted for opposing the regime. After news of security forces raiding his house, and lack of information about his whereabouts, concerns were raised of another enforced disappearance. “This enforced disappearance of a senior member from a prominent opposition party is a brazen attack on the rights to freedom of expression and association in Egypt. Enforced disappearance has become a routine practice by the al-Sisi administration to silence activists and opposition groups,” said Najia Boumain, Amnesty’s North Africa Campaigns Director. However, there have been some positive developments as well. Mahienour el-Massry, a lawyer and labor rights activist, was arrested in Alexandria for protesting the Egyptian government’s decision to transfer two islands, Tiran and Sanafir, to Saudi Arabia in 2016. An Alexandrian court in December 2017 overturned its decision to imprison Mahienour, and ruled to release her. Others have been targeted by authorities for criticising the state, such as blogger Alaa Abdel Fattah, who rose to prominence in the 2011 uprisings. After a tweet which criticised the Egyptian judiciary as “biased” and implied that the judges are “taking orders from the military,” Alaa Abdel Fattah was arrested in September 2017 and sentenced to five years in prison. In 2017, Cairo drafted a law placing greater restrictions on NGO activities within the country. One impact of this was the closure of the El Nadeem Center, an NGO that helps victims of torture and violence. The clinic was registered with the health ministry for the last 24 years. El Nadeem Center covered about 250 cases a month, including new victims, according to Suzan Fayad, the clinic’s director. Over the span of 20 years, the center documented around 14,700 torture cases, and 1,000 cases of domestic abuse. “I need you because the journey is not over,” Sisi told a mostly female audience in a speech on March 21. “I need every lady and mother and sister, please, I need the entire world to see us in the street” voting. Partly in response to calls for boycotting the elections and partly to keep the elections as a referendum to approve his hardline policies, Sisi had been urging Egyptians to go out and vote. Authorities hope that enough people will come out to vote to give more legitimacy to elections that have been dubbed as “sham” by many Western rights groups. Since most candidates had to drop out or even arrested after announcing their candidacy, voter enthusiasm has been low. “There is no doubt that the elections would have attracted more voters if there had been more candidates, reflecting a variety of political positions,” said Mirette Mabrouk from the Atlantic Council. Some have taken a direct stance in opposing the elections, however. In response to the rapid withdrawal of candidates from the elections, a coalition of seven left and liberal parties, joined by around 150 pro-democracy activists called for a boycott of the presidential elections, urging the public to stay home instead of voting. Mohamed Abul Ghar, the founder and chairman of the liberal Social Democratic Party, denied that the opposition was seeking to destabilize the country. “We neither want to destroy government buildings nor disrupt economic growth. We support Sisi in his efforts to root out the terrorists, but the way the authorities have handled the presidential election so far has left us deeply concerned,” Abul Ghar told Al-Monitor. Fourteen international and Egyptian rights groups released a statement criticizing the upcoming election, saying the Sisi government has “trampled over even the minimum requirements for free and fair elections” in his bid for a second term. Sherif Mansour says the government has further interfered with press freedom with the upcoming elections, showing greater lack of democracy. “Ahead of presidential elections, the government has been keen to silence any critical reporting,” Mr. Mansour told The Globe Post. Sisi is facing only a single rival, Moussa Mostafa Moussa, who had been cheering the president until a day before the deadline for registration to run for the presidency. Many say it is obvious that Moussa chose to run to save Sisi of the embarrassment of running alone. Mabrouk also believes the time is needed to improve Egypt’s political circumstances. “Social and political change takes time and it is unrealistic to cast judgment on democratization efforts four or five years after a revolution. Egypt is currently facing serious economic and security issues and Egyptians, naturally, tend to prioritize those and the president is perceived as one who can deliver on those,” she noted. Mabrouk added that the uprisings of 2011 have opened a door for change that will be impossible to close. Yet change will take time. In the meantime, Egypt faces other battles, such as stabilizing its economy that has weakened since the revolution. One of the primary reasons that thrust millions of people into streets against the rule of Morsi in 2013 was crushing economic situation — skyrocketing food prices, fuel shortages and high unemployment. As soon as Sisi toppled the Muslim Brotherhood government, tens of billions of dollars in Gulf money started pouring into Egypt to prop up its ailing economy. Even that failed to fix it in the past 5 years. After the revolution, Egypt’s interim government raised the minimum monthly wage for all state employees from 700 Egyptian Pounds ($102) to 1200 pounds ($174), to be implemented as of January 2014. Critics, however, said this was insufficient raise, and showed a lack of care from the government, and that that would not appease the frustrated masses who protested in the revolution. In the last couple of years, Egypt’s inflation rate has indeed soared. Figures from February 2017 showed the annual rate was over 30 percent — the highest rate for the country in over 30 years. Commodities like food, healthcare and transportation have become less affordable, hitting ordinary Egyptian citizens the hardest. The inflation rate had eased to 21.9 percent by January 2018, however, reported the state-run statistics agency CAPMAS. The increase in food and beverage prices had slowed too. This showed hope for economic improvements in Egypt. Egypt’s unemployment rate has wavered between 12 and 14 percent in the years since the revolution, with the majority being 15-29-year olds. However, many young Egyptians at work are employed in low-wage jobs for the informal economy. Egypt’s economy had also been hurt by a sharp drop in the tourism industry, which makes up nearly 12 percent of the country’s GDP, and is a major source of employment for Egyptians. This is largely because other governments issued multiple travel warnings for their citizens due to a series of bombing attacks, kidnappings and fragile security situation across the country. Many people who work in the tourism industry report a huge fall in business in recent years. Ali, who organizes group tours in the historic Valley of the Kings in Luxor, which is home to dozens of tombs for Egypt’s ancient rulers, says he is struggling to keep his business going. He recently had one-day group tour, but this was the first he had in several weeks. “I have struggled to obtain enough customers. People just stop coming here. There is so much for tourists to see in Egypt, but our country has been given a bad image because of the terrorists,” Ali, who didn’t want to give his last name, told The Globe Post. “I am sure once people forget about the problems that have happened in Egypt, tourism will become better in the future,” he added optimistically. There is indeed hope for improvement. Egypt’s tourism industry had rebounded by 2017. Between January and September, around 5.9 million tourists visited Egypt, an increase from the 3.8 million that visited in the same period in 2016, according to Ministry of Tourism figures. While still a fraction of the 14.7 million Egypt attracted in 2010, before the revolution, it shows it could keep growing. Yet the main factor in Egypt’s tourism drought is terrorism, which may continue to threaten Egypt. Above all, as a military general, Sisi mostly represents stability and security for a country that is plagued by a series of bombing attacks in the past few years. “We used to have terrorist attacks a lot. But we have strong military and security forces. I feel very secure with the regime, and I trust it can do a good job of protecting us. Lots of Egyptians feel this way too” Abdelrahman, an engineer from Alexandria, told The Globe Post. “Even though some say we have don’t have a good democracy here, I think it is better to have a strong leader who protects us, rather than a weak democracy where there could be more threats of terrorism,” he added. Attracting international headlines were a string of attacks on Egypt’s Coptic Christian minority, who make up 10 percent of the population. At the end of 2016, militants staged a bombing attack on St. Mark’s Cathedral in Cairo, killing 25 and injuring 49. Following this were numerous attacks, including two attacks on separate churches on Palm Sunday in 2017, killing over 45 Copts. Following that was the killing of 28 Coptic pilgrims on a bus by armed militants, who were traveling to a monastery in Minya. Last December, eight civilians, and one policeman were killed in two separate attacks by gunmen, in a Coptic district in Helwan, south of Cairo. “Our community is singled out by Islamic State and other extremists. Many of us do not feel safe at all anymore,” Mina, a Coptic Christian and shop owner in Cairo, told The Globe Post. “But these people have nothing to do with ordinary Egyptians. All Egyptians live in complete peace, Muslim and Christian. It is just these evil people that are trying to divide both religions, and who give Egypt, our wonderful country, a bad name,” he added. In response to this security threat, Egypt has led a military crackdown in the Sinai Peninsula, targeting numerous Islamist movements. The campaign stepped up drastically after the Sufi attack in November. For Sisi, this is perhaps a greater challenge than the elections, which is largely guaranteed. Egypt has struggled to control it since the 2011 revolution. After the revolution, militant activity has only escalated in Sinai. After the coup, Sisi’s government has clamped down hard on insurgencies there in a bid to regain control. In response to attacks on soldiers in Sinai, where dozens were killed, Sisi declared a state of emergency in 2014. The state of emergency was also introduced after the Palm Sunday attacks in April 2017 and has been extended repeatedly since. Egypt’s military currently carries out operations in Northern and Central Sinai, the Nile Delta and the Western Desert. Its most notable adversary in the area is Islamic State in Sinai, formerly known as Ansar Bayt al Maqdis. The faction is believed to have around 1,000 fighters in the area. ISIS was also responsible for bringing down a Russian plane in Sinai in December 2015, killing all 224 passengers and crew on board. The Egyptian military recently stepped up the campaign in response to devastating Islamist attacks. In November 2017, after the Sufi mosque attack, Sisi pledged to restore “security and stability to Sinai within three months,” demanding “complete brutal force” on militants, after the previous mosque attack. “In three months, with God’s grace, and with your help and sacrifices and those of the police, Egypt will restore stability and security in Sinai,” Sisi said. Egypt also targets other militant groups. One of them is called Hasm (Determination) and is allegedly linked to the Muslim Brotherhood. The group has reportedly targeted Egyptian security officials, including a high-ranking police officer. Egypt designated Hasm a terrorist organization in February 2017, banning its activities in the country. The lesser-known Liwaa el-Thawra is also accused of targeting Egypt’s security forces. Both groups, however, condemned attacks on Coptic Christians in 2017. 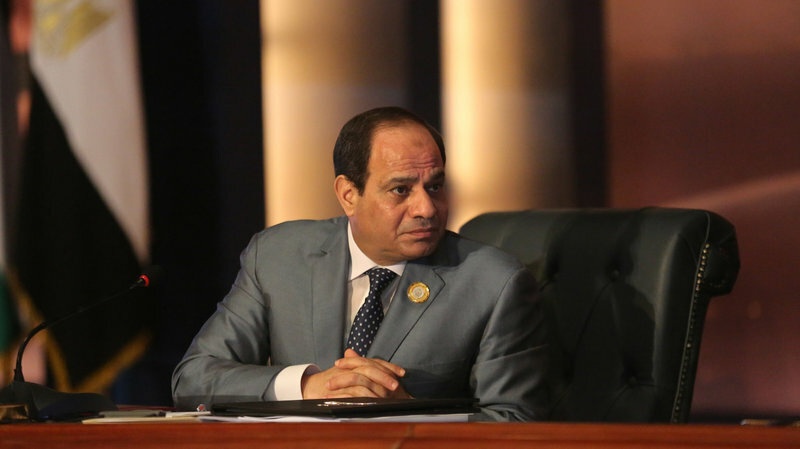 Egypt’s security-first policy in Sinai has faced criticism as well. Despite having tens of thousands of troops in Sinai, security climate has not improved. Cases of human rights violations by the military have been recorded during the Sinai campaign. “In April 2017, we verified a leaked video showing military forces in North Sinai executing seven unarmed individuals extra-judicially, including a 17-year old child. Most recently, we verified a video issued by the military proving the use of cluster bombs by the Egyptian military in Sinai,” Hussein Baoumi told The Globe Post. Baoumi also added that the military’s banning of events in Sinai casts doubts on its adherence to international law. However, The New York Times reported in February that Israel and Egypt had a “secret alliance” against ISIS in Sinai. After the Russian jet was downed by ISIS in late 2015, Israel reportedly carried out a secretive air campaign with Sisi’s approval, to help Egypt contain the problem and to remove the threat south of its own border. Egypt has denied these claims. American officials say Sisi is trying to conceal Israel’s role in the air campaign against ISIS. 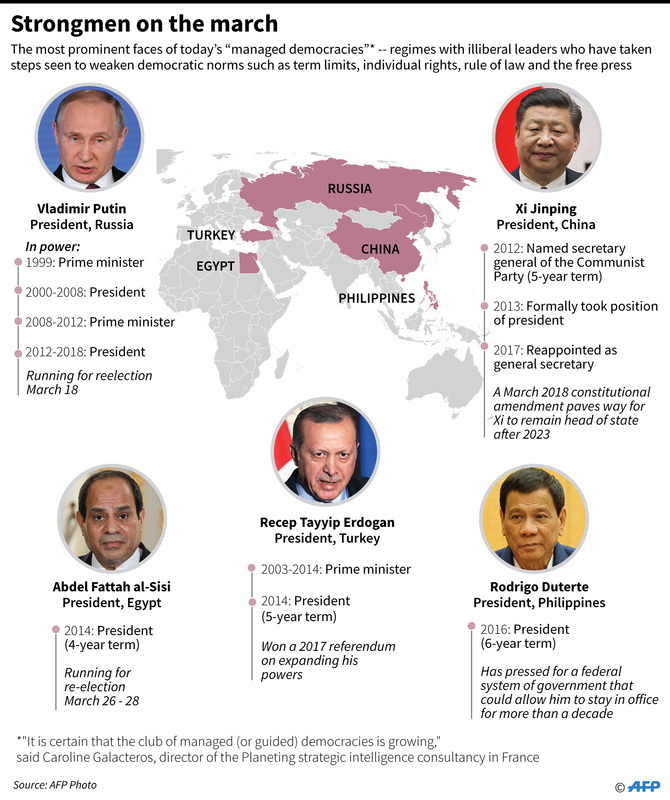 Since 1979, when Egypt changed its course and charted a pro-Western foreign policy, essentially switching places with Iran, its domestic policy has always been heavily influenced by its geopolitical decisions abroad. January 25 revolution was part of a regional wave of discontent, and so was its undoing. During his one-year rule, Morsi turned Egypt’s face to Turkey, Qatar, and Iran, a policy that angered Israel, Gulf nations, and the U.S. The military coup in 2013 upended these alliances. One of the most delicate relationships Cairo built over decades is with Israel, a sensitive matter for a country that was once occupied by the Jewish republic and still a taboo subject due to the Palestinian cause. But this didn’t stop the Sisi government to closely work with Israel, albeit in secret, in the fight against terrorists in the Sinai Peninsula. Peace with Israel also secured precious U.S. financial assistance, making Egypt the second largest recipient of U.S. foreign aid after Israel. During the Obama administration, the U.S. government had partially cut the aid over Egypt’s human rights abuses. Sisi, however, usually presents himself positively to European governments and Washington. A senior official in a key state said that “we know Sisi is bad for human rights. But he is good at killing terrorists,” Baoumi cited. Last year, when President Sisi was set to meet with U.S. President Donald J. Trump in Washington, Egyptian courts suddenly acquitted Ayaa Hijazi, a dual American Egyptian aid worker who founded a non-governmental organization to help street children. She was imprisoned for three years on trumped-up charges, and her release allowed the Trump administration to cast the incident as a diplomatic triumph. Trump didn’t even realize that she was jailed during President Sisi’s presidency and surprised to learn that it was not Morsi’s government that imprisoned her. Saudi Arabia and its Gulf neighbors have been losing sleep over the march of the Muslim Brotherhood in the region during the Arab Spring. They were quick in bankrolling the government of Sisi as soon as the military removed Morsi from power. 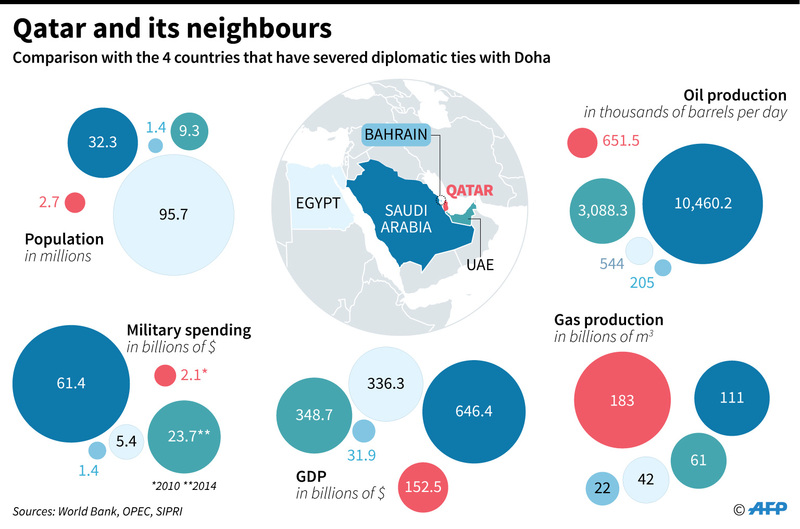 As a payback, Egypt joined last year Saudi-led embargo on Qatar, chief donor of the Morsi government. Egypt is a member of the so-called Anti-Terror Quartet (ATQ) — a bloc of four Arab states that include Bahrain, Saudi Arabia, and the UAE, which launched an economic and diplomatic blockade on Doha on June 5, 2017, which is still in place. Unless Qatar stopped supporting terrorism, cut ties with Turkey and Iran and shut down Al Jazeera, these Arab states vowed to continue imposing the blockade. Egypt is also largely dependent on the GCC for its economic development, which plays a vital role in stabilizing Egypt’s shaky economy. Egypt also joined the anti-ISIS coalition in 2014, and the Saudi-led coalition in Yemen in March 2015. Egypt and the UAE have conducted airstrikes against Islamist militias in Libya while supporting Khalifa Haftar’s Libyan National Army (LNA), while Qatar has backed Islamist militias. 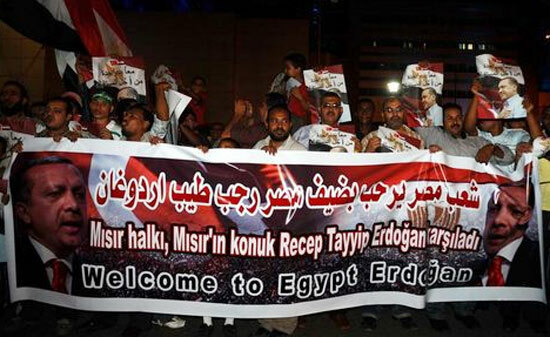 In September 2011, then-Prime Minister Recep Tayyip Erdogan of Turkey arrived in Cairo to the raucous crowd, who gave a hero’s welcome to a leader who stood up in solidarity with Gazans and endorsed the Egyptian revolution a few months ago. Until the military removed Morsi from power in 2013, Turkey pledged $2 billion in loans and unconditional political support in the international arena, ganging up with Qatar to keep the flailing Egyptian economy afloat. Turkey helped Egypt negotiate financial aid package with the IMF (failed), struck lucrative trade deals and promised private investment. None of them was successful to rescue the collapsing economy. Few days before mass protests demanding Morsi step down in the summer of 2013, Erdogan sent his spy chief Hakan Fidan to meet with Morsi. He would warn him against the looming military takeover as well as work together to draft plans to quell the protests. Ankara urged the former Egyptian president to “keep resisting” and to hold dueling protests. The plan led to the military coup and subsequent massacre of hundreds of pro-Morsi protesters on August 14, 2013. The government of Sisi has never forgiven Erdogan for his role before and after the military coup. Both countries are locked in a five years long dispute and taking different sides in regional conflicts. Over fears that Turkey may align with Iran, Saudi Arabia has tried on numerous occasions to reconcile its two, big Sunni allies, to no avail. In December last year, President Erdogan visited Sudan, a country bound by the Nile with Egypt, to meet with President Omar al-Bashir. The visit outraged Cairo, with the state media blasting Sudan for “playing with fire.” In just a matter of few years, the most popular Muslim leader in Arab streets is now the biggest villain in Egypt. Will Democratic Transition Succeed in Algeria?